Those readers who have been following our “Grand Old Buildings” series on the Duluth Civic Center facilities for the past three months have likely picked up on a theme: the current facility—whether it be the county courthouse, the county jail, or city hall—was deemed insufficient. The courthouse was first, and along with it came the so-called 1908 Burnham Plan, which called for grouping the municipal buildings along 5th Avenue West between First and Second Streets. The courthouse was finished in 1910, but it took until 1925 to move prisoners into a new jail and until 1928 before the city government relocated from its historic 1889 building. The story of Duluth’s federal building is very much the same. In fact, the 1894 Post Office and Federal Building was the first facility of the group to be declared obsolete—and the last one replaced. Duluth’s grand Romanesque Post Office and Federal Building was just 11 years old in 1905 when Senator Moses Clapp introduced a bill to construct a second building, adjacent to the Post Office, to create more space. That plan was dropped the next year, and instead an addition was made to the 1894 building. After the Burnham plan was approved, the federal government ordered that a site be purchased within four years, but it would take until 1916 for the money to be appropriated. In the meantime, Duluth’s postmaster A. P. Cook called time and again for a new building, even urging the Duluth Commercial Club to send a delegation to Washington D.C. to lobby for a new building. In 1913 the Post Office introduced Parcel Post, which increased space demands. That year Congressman Clarence B. Miller introduced a plan for a $1.2 million federal building. Duluth was so confident the new building would be funded, the Duluth News Tribune ran a Sunday illustrated essay about the “New Federal Building.” Five months later the newspaper declared such a structure was in Duluth’s “far distant” future. It looked like things were moving in 1915. Federal inspectors found the 1894 building overcrowded, and city commissioners pointed out that since ground was broken for the old facility in 1892, Duluth’s population had jumped from 25,000 to over 90,000. The federal government did not have enough money for a new building, but after a Duluth News Tribune editorial suggested that the government was “welching” on its 1908 agreement to be part of the civic center, it had to show its sincerity. So in1916 the government purchased the site for a new federal building, but World War I put a stop to any more government building appropriations until 1919. As soon as the war ended, Duluthians revived their campaign for a new building. The Commercial Club and Senator Knute Nelson lobbied for a $1 million building that year, but the bill did not pass. In 1923 Republican Calvin Coolidge became president, and the Republicans controlled Congress—it was thought that this scenario would make it likely for a large building appropriations bill to pass, and Duluth was high on the list for a $650,000 facility—but to no avail. Finally, in February of 1927, the federal government appropriated $1.2 million for a new facility. James A. Wetmore, acting supervising architect of the U.S. Treasury Department, designed the new structure in keeping with Burnham’s plan and the Civic Center’s existing buildings. Ground was broken on May 24, 1929. Unlike the laying of the stones for the county courthouse, county jail, and city hall, the ceremony was simple: no grand orations or Masonic ceremonies. The same would be true about the building’s opening and dedication. The Feds simply weren’t as demonstrative in their celebrations as the Duluth citizenry had been for previous Civic Center accomplishments. Designed in the Renaissance Revival style of architecture, the building is compatible with the other buildings that form the Duluth Civic Center Historic District. The Renaissance Revival style was commonly selected for prominent public buildings because it conveyed the dignity of the government. The building displays many classical elements such as a balustrade, columns, symmetry, and classical motifs, including medallions and dentils (square blocks) that define the Renaissance Revival style. The [building] is faced with polished granite and has a terra-cotta cornice. A flight of granite stairs with granite abutments leads to the first level of the building. A terrace enclosed by a classical balustrade encircles the building. The first story features rusticated granite with tall round-arch openings topped with scrolled keystones. Small, rectangular paired windows are above the arches. The upper stories, which are defined by a string-course and faced with smooth, ashlar blocks of granite, are dominated by two-story engaged Doric columns that separate large windows. These simple columns indicate the location of interior courtroom spaces. Cast-iron spandrels (triangular wall panels) separate the windows, and carved granite spandrels with eagle motifs are located at each end of the facade. Each column is topped with a medallion. Above the columns, the terra-cotta cornice features a dentil course and decorative anthemia (honeysuckle or palm leaf ornaments) at the roofline. The interior of the first floor contains public spaces that retain many original finishes and features. The floor of the main lobby is covered with light orange quarry tile with green marble borders. The walls are faced with Mankato stone and feature ornamental grilles. The public lobby floor is covered with Tennessee marble with green marble borders. Mankato stone also covers these walls. The plaster ceiling has ornamental vents and brackets, and original light fixtures are found on both the walls and the ceiling. The post office lobby is adjacent to the main lobby and contains similar flooring materials. The baseboard, wainscot, and counters are white marble with gold veins. The walls have wood trim and Mankato stone piers. The paneled plaster ceiling and decorative brackets remain in place, as do original lighting fixtures and bronze postal boxes. The fourth floor contains three courtrooms that are very similar in appearance and retain many historic components. Covered with panasote, a type of artificial leather, doors feature bronze brads and kick plates. Walls are clad in sound-absorbing artificial stone that is an original material. Paired pilasters (attached columns) with Corinthian capitals dominate the wall behind the judge’s bench. White marble with gold veins is used for door surrounds, baseboards, and on the steps to the judges’ platforms. Original light fixtures descend from the ceilings. Tall, arched windows and large, rectangular skylights bordered in a geometric pattern also illuminate the courtrooms. It took another eight years for the federal government to demolish the 1894 building, and after that the Works Project Administration helped landscape its former location and the grounds around it. They created a circular driving court with a center plaza featuring Cass Gilbert’s Soldiers and Sailors monument and a fountain, later renamed Priley Fountain in honor of community booster Joseph Priley. By then the 1929 Federal Building and Post Office had settled into a regular routine. In 1958 the government allocated $90,000 for improvements to the building, including $52,000 worth of fluorescent lighting, a new $11,700 roof, some tile work and exterior painting. The government also spent $20,000 to make the elevators run automatically. The Post Office moved out in 1970 for its new home in the West End while retaining a much smaller office in the Federal Building); at the same time, the building name was changed to the Federal Building, U.S. Courthouse and Custom House. 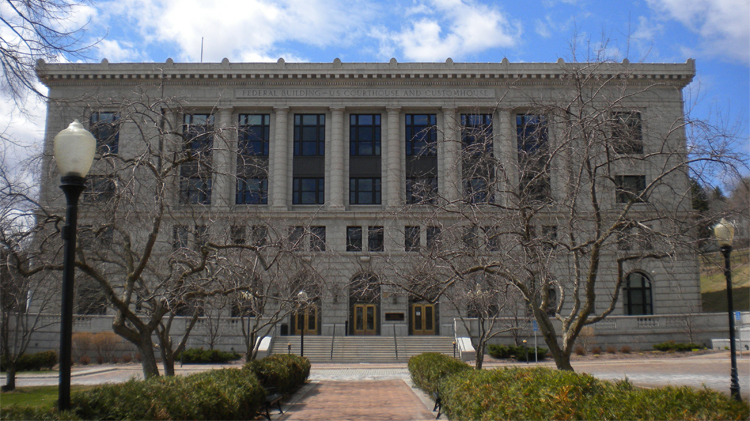 Sixteen years later the building was placed on the National Register of Historic Places along with the 1909 St. Louis County Courthouse, the 1923 St. Louis County Jail, and the 1928 Duluth City Hall as the Duluth Civic Center Historic District. In 2005 the lobby, which had been altered when the Post Office moved out in 1970, was restored. The government even redesigned the elevator lobbies to look more historically accurate and replicated the original post office window. In 2007 the government renamed the building in honor of Gerald W. Heaney. Heaney served in the building as a federal judge of the Eighth Circuit Court of Appeals from December, 1966. Prior to that, Heaney made his name as a labor lawyer. He served as an Army Ranger during World War II and was among those who stormed the beaches of Normandy on D-Day. After the war he rewrote Bavaria’s labor laws and became a trusted advisor to many Democratic politicians, including Hubert Humphrey, Adlai Stevenson, Orville Freeman, Eugene McCarthy, and Walter Mondale. Heaney retired in 2005 and returned to advising politicians and served as co-chair of Don Ness’s 2007 mayoral campaign. Heaney died June 22, 2010. Special thanks to Leion Witte and Alex Smith of the General Services Administration for help researching this story.